While factories across the Midwest shutter their doors, Cleveland-based manufacturer Lincoln Electric has thrived for more than a century. In addition to being profitable and technologically innovative, through good times and bad, the company has fulfilled its unique promise of "guaranteed continuous employment." Workers are viewed as assets — not liabilities. Through flexible hours and job assignments, as well as a merit-based bonus system, Lincoln Electric's employment policies have proven healthy for the company's bottom line, its employees, and its shareholders. 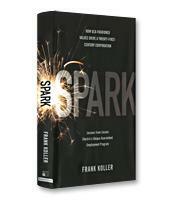 In Spark, veteran journalist Frank Koller tells the story of how this unusual and profitable Fortune 1000 multinational company challenges the conventional wisdom shaping modern management's view of the workplace. How to succeed by treating employees the right way. How more equitable practices can rebuild trust in management. How compensation can grow in tandem with productivity and profits. How unusual policies can add value to your people, customers and society.